Sweet child of mine what am I doing? It is here, the big day, the day I Sophie Fox, who once ate a kebab I found in a drawer, is running a marathon. To clarify, I had been out, bought a kebab on the way home, couldn’t finish it, put it in a drawer for safekeeping (obviously) and then finished it the next morning. I thought that was going to make it sound better but it didn’t. The worst part was that my Mum had prepared a lunch which I of course then had to eat. I couldn’t exactly say no. “Yeah sorry mum, I can’t eat your perfectly prepared lasagna because I’m still pretty full from that kebab I found in my drawer“. Sandy Fox would not have been impressed. I WISH Nathan Fillion was my mum..no wait that came out wrong. My point is that not too long ago I would have laughed at the idea of me doing a marathon. Hell, I am laughing now but I think this might be out of fear. Please let this be a warning to you all not to make any rash decisions on a hangover. 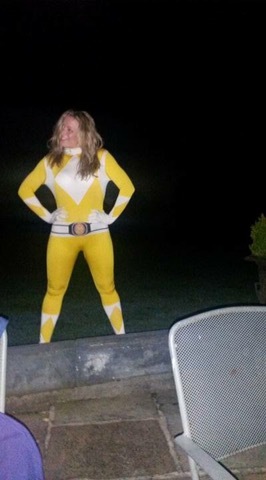 I was feeling all emotional from wine and a bit cocky because I had lost some weight and dressed up like a power ranger and one thing led to another and I was signed up. So here we are. It is what it is. I have trained for it so hopefully it wont be a total disaster. I have not trained anywhere near enough, mind, but I think in these circumstances ignorance will definitely be bliss. Like a first time mum about to give birth I know it will be very long, very painful, and very tiring. I just don’t know how exactly how long, how painful and how tiring it is going to be. If I did I wouldn’t do it. Anyway they say with labour that you forget about the pain the instant you hold your baby in your arms. Seeing their little face makes it all worthwhile. The downside of this analogy is that I can’t opt for an epidural and spend the last two hours of the marathon dead from the waist down and watching Loose Women. There is probably the same chance of pooping though so that’s good. GET THIS RUN OUTTA ME!! Looking positive, after the hours of work when I finally hold the medal in my arms I can look at it fondly, put it in my bag, and go for a drink. The medal is not going to want feeding, changing, or wake me up in the night crying. I won’t have to spend thousands of my hard earned pounds putting the medal through university. I won’t worry about it texting boys or being cyber bullied. It will just hang on my wardrobe door until I get annoyed by the clanging and fling it under the bed. In preparing for the run I could have stuck to a tried and tested marathon training program of long runs and high intensity training with allocated rest days and plenty of fluids. Instead I opted for the less well known program of eating loads over Christmas, not running because it is too cold and I don’t like to run in the rain, followed by three months of sheer panic, more eating and then googling “tips for running a marathon” hoping for an answer other than “start 6 months in advance or else don’t bother”. The worst thing about running a marathon is getting advice from marathon runners. They take it so seriously. I mean I know it is a long way and everything but you are jogging for an extended period of time, this isn’t solving the economic problems of sub-Saharan Africa or working out how they actually got away with it in Ocean’s 11. I have watched this film a billion times and I still don’t understand how the paper was in the bags and in the vault. Dear God tell us!! The Googling did work in some respects. I found this wonderful page created by the Oatmeal. If Sports Direct comes out of administration you will have me to thank. So screw all reasonable and sensible advice – I am going to power through with the help of sheer stupidity, a Primarni watch, a Lionel Ritchie playlist, and the excellent nutrition as provided by Lucy Fox’s homemade Florentines.